Most of the time of our day is spent in office for the majority of the people. Some enjoy spending and working while others dread at the idea of going to the office. It is not guaranteed for everyone to land up in a dream job, but one can find a way to be enthusiastic about to go to the office. Every Monday morning people are not happy to go to the office and hence, the phenomenon of Monday morning blues is made. Just by changing the place where you sit in an office, by adding some colors and fun you can be assured that you will love to be at the office. For that, one must apply some best office cubical decoration ideas to make his/her cubicle look awesome. Bulletin board is the place where you put all your necessary information for the day or your week. Just by changing the look of the bulletin board will add more life to your cubicle. Try using a colorful board, or add printed papers to it. If it is boring white then you can decorate it with colored origami of flowers and birds and use your imagination to place it. Keeping a desk calendar is helpful for keeping up with the track of the day. Put a nice funky calendar on your table with interesting images, or use your creativity and design your own calendar for your cubicle. An interesting calendar will add life to your cubicle. Nowadays almost everyone works on desktop computers, hence just by changing the desktop screen with some interesting visual will bring the change in the whole of space. Make a screensaver of all the interesting images, it could be from your family vacation to interesting nature photographs or even inspiring quotes. It is a great idea to keep a small plant in the cubicle. But before doing it be assured that you or no one around you has allergies of some kind. Keeping a small plant will be quite refreshing in the morning but ensure that you take good care of the plant on the daily basis. Few cubicle friendly plants are English ivy, wandering jew, asparagus fern and there are many others too. Having a pen stand on the desktop is important as it allows you to keep your pens and other smaller accessories in one place. Rather than keeping a boring simple pen stand use a colorful and a funky one. A day pen stand is also a good ideas where you can make your own style of slots keep your pens and accessories. Put some posters on the wall of your cubicle it can be anything from an inspirational quote to any of your favorite character or if your are a creative person then you can pin your own sketches. Arrange the posters in different size and patterns, play with space on the wall and the posters and create what feels good. If your cubicle is one of those which is in the corner of the office then keep a nice table lamp in the corner. It will lighten up the area and will provide a visual appeal. You can also play around with the bulbs and patterns of the lamp, from regular tungsten bulb to colored bulb or any designer lampshade available in the market. Fairy lights are one of the popular decors in a room. It creates a certain glow and adds beauty to the place. You can put the fairy lights at the edge of the wall of your cubicle and in the evenings you can switch on the lights, it look beautiful and also homely. Another important part of a cubicle are post it, it is highly used to remember something important. Therefore, once can experiment with the shapes, colors and designs of the post it. You can cut your own style from the paper or can make your own and out a double sided tape to it. While writing a note, you will feel good about it. When decorating your cubicle do not leave your chair behind. There are various kinds of cushions available in the market from various patterns and impressions. It could also be inspired from a certain culture. It will not only be comfortable for your back but will be adding beauty and homely feel to you space. The board pins can be experimented with, use cool and funny board pins to pin up the papers on the bulletin board. There are various kinds of pins in the market and you can choose which ever you find the best. Pin up all your important information and put on your board in style. Put some nice photo frame with your family picture in it on the table. Make your own photo frame, add some shells to it or glitter it, whichever goes with your cubicle. Another way to do it is by putting a colored thread and clipping lots of images onto it across the wall of your cubicle. It will look pretty and interesting to look at. Every cubicle has a telephone to connect to the other employees of the place. Add some funny ideas to it or a moustache to your phone, give the overall funny look to your phone as it has come to life. Or anything from a quote to a nice touch of colorful ribbons. A mouse pad is one of the understated product on a table. Use quirky mouse pad and see how it changes the look of the table. With so many options available choose an interesting mouse pad, it will be fun while using it and a break from a regular boring monotony of the black and white simple mouse pads. Once in a while everyone needs a cup of coffee, while working it helps to keep one refreshed and prevents from falling asleep. Try a new coffee mug with beautiful customized prints. It could be something which conveys your emotions or as interesting an optical illusion. Not only it is fun drinking from it but will be catching everyone’s attention. There is always a requirement to store papers and important notes on the table. Rather than putting everything in one corner, get a nice small shelf for the table. Keep your important papers in them along with other important documents. It will keep your table organized and clean while looking pretty on the table. To get the feel of better space especially if you find the cubicle is small, add some beautiful mirrors on the cubicle wall. The reflection as seen on the mirror will give the illusion of the spacious cubicle, making you feel more comfortable in space. Another good thing is, you can always look in the mirror before going for a meeting and can be the best of you for the same. Light colors when used in space gives the feel of spacious and open, therefore, it is good to use light and bright colors in your cubicle. While decorating your space get papers of lighter shades even with the print on it. This will make your area lively and happy since you spend most of the day in your cubicle, working bright colors will keep you pepped up throughout the day. Along with the table, many people tend to have huge cabinets where they keep their file and important documents. Buy some nice printed papers which can go with your cubicle and stick it to them. Before doing it, do check if they can be removed easily so as to avoid any damage fine from the company. Then just by coloring your cabinet will completely change the outlook of space. No matter how colored your pace is if things are not neatly arranged then there is no point in decorating it so much. 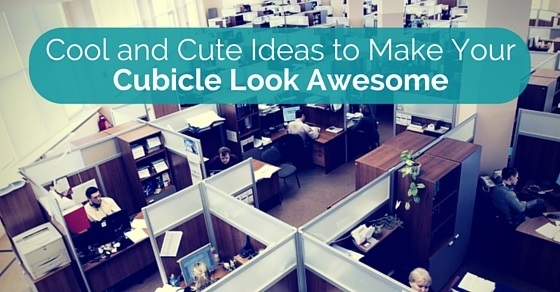 The essential part is making your cubicle look awesome it should be neat and organized. Assign space for each of your product and try putting things in their place, making it easy for you to manage. The Above few points will tell you about how to make your cubicle cool and help you to keep your workspace fun and will definitely motivate you to perform better. It is not necessary to apply all the steps, but few will change the complete outlook of the area.